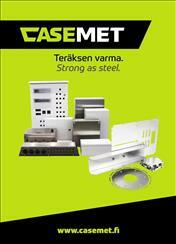 Casemet is a Finnish, family-owned company, mainly focused on metal enclosing solutions. We also provide subcontract manufacturing of electro-mechanical components, and sheet-metal structures. Our way of working is based on the flexible and customer-oriented service, high­quality and reliable manufacturing, high level of product fine-tuning and delivery reliability. Customer satisfaction is matter of honor to us. We follow laws, authority regulations and other binding obligations in all of our operations. Our operations are under continuous development, aiming at decreasing our waste generation, use of raw-materials and energy consumption even more in the future. Casemet management is responsible for the operations and development of quality- and environmental management systems. Management ensures that sufficient conditions are being created for quality creation and environmental goals and operations. Management also underlines that everyone in Casemet is aware of the objectives and policies related to quality and environment. We're dedicated in continuous development of our operations. We encourage our employees to participate development operations. Corner stones of our development are, attending to the needs of our customers and stakeholders, personnel competence development and Lean leadership principles. We see feedback as a possibility to improve. Every employee working for Casemet is responsible for the quality of their own work and they are obliged to act and perform acco ing to our quality- and environmental management system.